The Lagos side-mirror is endangered and someone has to do something about it. 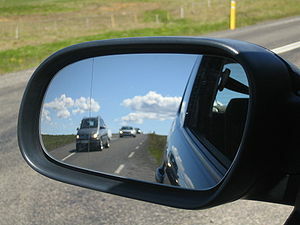 Every car comes off the assembly line with two unique side-mirrors, the beginning of a life-time ménage a trois. The car and the side mirrors work hard together under the hot sun in the traffic, huddle together in the rain and enjoy those long, moonlit nights in each others’ company. In Lagos, this happily ever after almost never is. From the days of area boys smashing the side-mirrors of “one-way” infringers, to one-side mirror being stolen at wedding receptions (why just the one?) to okadas scratching them in every single go-slow , the Lagos side-mirror has suffered violence and the violent keep triumphing by their force. Lagos has now been rated 300th out of 299 cities surveyed for the likelihood of cars to be scrapped with the same two mirrors (10+ years of use) with which it left the manufacturer’s warehouse. Only today, I lost my second side-mirror in three years. I was at the front of the queue at the traffic lights. Once the lights turned green, the cars in my lane (on the right) would go forward and the cars in the lane to our left would turn left. Easy, no? Well, the lights turned green and, out of nowhere, this construction truck raced up and tried to squeeze itself in between my car and the median in the road. It almost succeeded. The measure by which it didn’t make it resulted in the smashing of the side-mirror on the driver’s side of the car. I swear I virtually heard my car heave a moan of despair at its bereavement. At that unfortunate moment, I snapped. It was the final straw, you know, the one that broke the camel’s back. How much longer will we stand by and let the dregs of society continue this inhumane action against side-mirrors and their owner cars? How many more vehicles will go through the traumatisation of losing their assembly-line mirrors? Apart from affecting their sense of perspective and hindsight, other studies show that 73% of Lagos-based cars find it harder to concentrate for the first 13 months after an assembly-line mirror is replaced. The statistic goes up to 93% when the replacement side-mirror is a “Made in China” tokunbo. A few cases of loss of horsepower have even been reported but studies are currently inconclusive. The time has come to pool all our collective goodwill and money into the brand spanking new NGO I’m about to register (the MirrorMax Movement) and let’s save the assembly-line side-mirror. The MirrorMax Movement will take donations from sympathetic members of the public and plough it into the development of the MirrorMax MirrorCush™ (patent pending). This revolutionary device creates a protective force-field around side-mirrors, ensuring that even if the car is smashed by a speeding train, the side-mirrors will always remain attached to the car. Until the very end, when crushing does them part. Given the data available to us at MirrorMax, the business of this NGO is extremely urgent and needs to be taken expeditiously across all the motoring locations in Nigeria and, eventually, to the ends of the earth. Going by the Doctrine of Notorious Facts, this clearly means that one of our most pressing needs is a private jet, as we have no time to lose. If you feel as strongly about saving the precious vehicle/side-mirror relationship as we do at MirrorMax, then you must give violently – the earlier it seems like we’re reaching our targets, the better. Side-mirrors are counting on us to stop the genocide. Will you stand up and becounted? Let me be the first to sign up….